Map It! 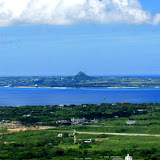 Okinawa: "Motobu Fuji 本部 富士"
The view you see above was taken from a very large hill top in Motobu Town. 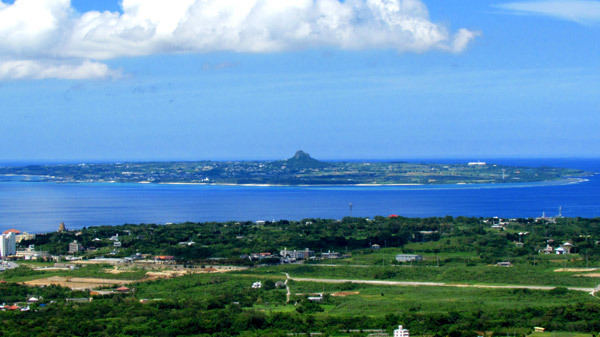 The island in the background is Ie Shima and the hill top – perhaps one of the best vantage points on Okinawa to see this beautiful island. 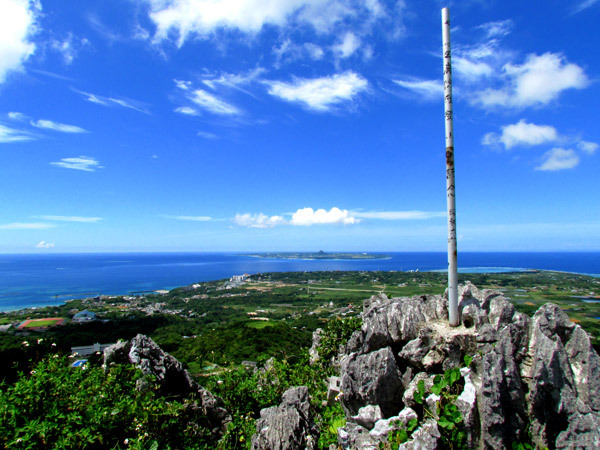 Welcome to Motobu Fuji, Okinawa's own little Mt. Fuji. From a distance, Motobu Fuji blends in with the many large hills that already lace the Motobu Peninsula making it difficult to distinguish which hill is which. Nevertheless, the view from the top is remarkable. 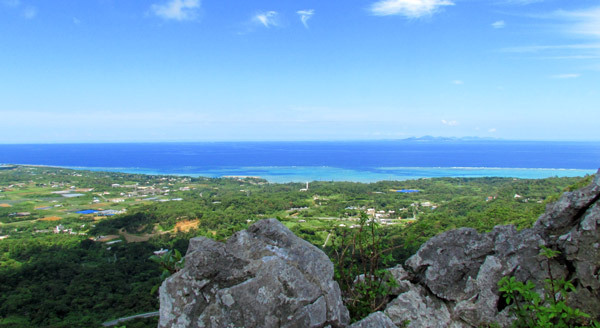 On a clear day you can see Minna Jima, Ie Shima, Izena & Iheya islands and to the east – Mt Yaedake and even the tip of Northern Okinawa (Hedo area). 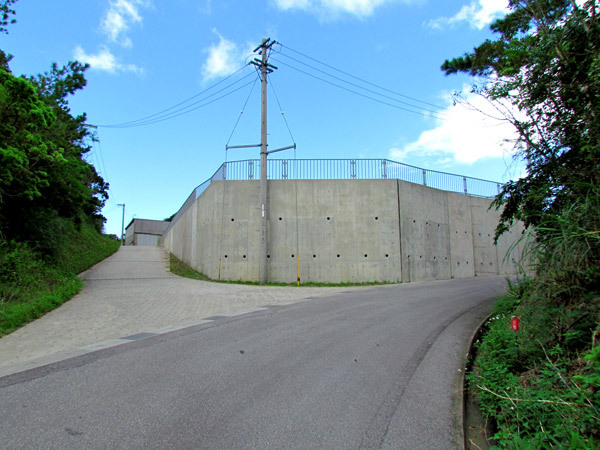 Though the elevation of Motobu Fuji is roughly 218 meters (715 feet), the climb is still a challenge and even a little treacherous. 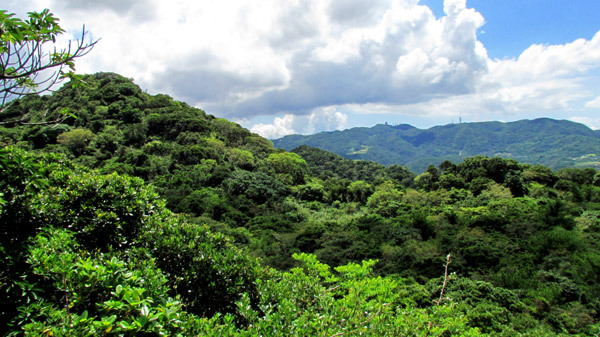 Motobu Fuji, like most large hill tops on the Motobu Peninsula, are covered with large jagged rocks known as karst. 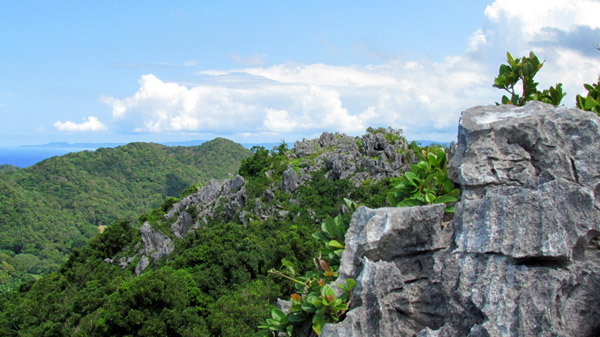 About ninty-five percent (95%) of the trail to the top of Motobu Fuji is covered in karst. Climbing to the top is a wonderful, small adventure and one you are sure to enjoy. Click here or click on the photo album above for more pictures from Motobu Fuji. The Trail. 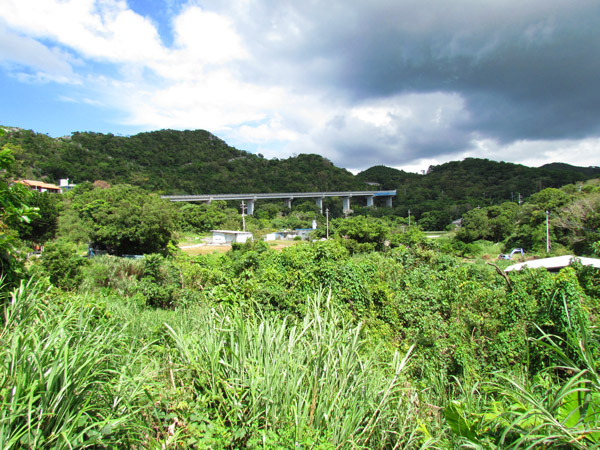 There are two entrances leading you to Motobu Fuji, There is a 'west entrance' and an 'east entrance'. Directions below take you to the 'east entrance'. There is designated parking and restrooms available near the east entrance and it is a little easier to find. The GPS coordinate above is to the parking area of the east entrance. From the east entrance parking lot, you just have to walk up the road and you will see a set of steps to your left (LandMark icon above). From here, you will walk about another 300 meters where you will see another trail on the right. 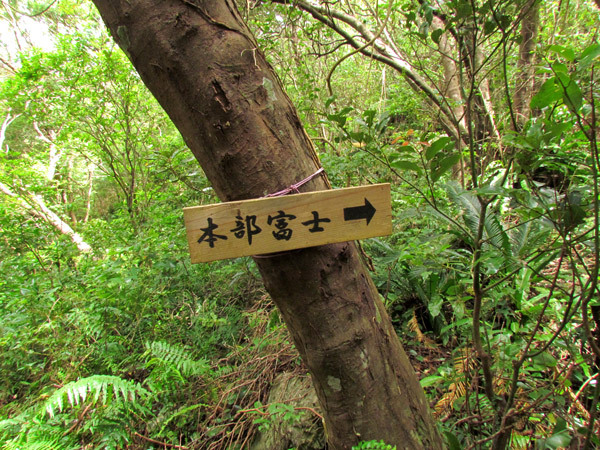 You will see a wood sign with the kanji, '本部 富士' (Motobu Fuji) pointing you the way. 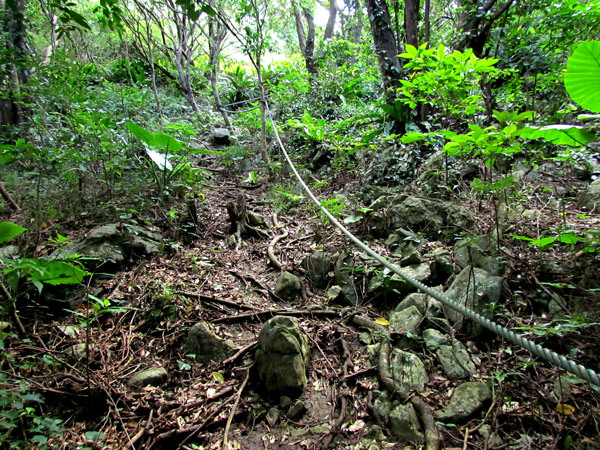 A few feet away you will see a guide rope to help you ascend the hill. With the exception of a small chain rope near the top, this is the only guide rope you will see along the way. Please Note. 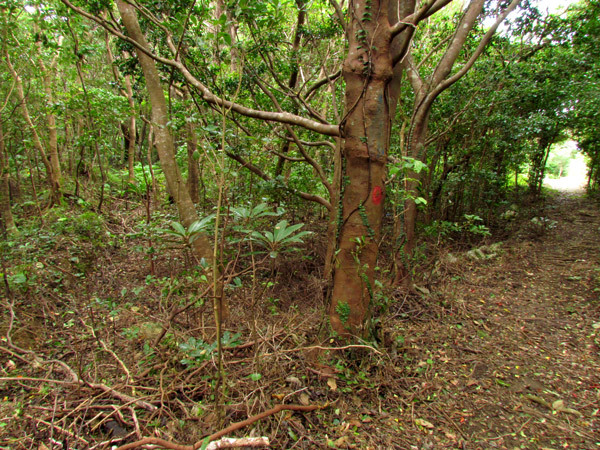 Prior to arriving at the wood sign (coming from the east entrance), you may see red spray paint markings taking you to a trail on the left. 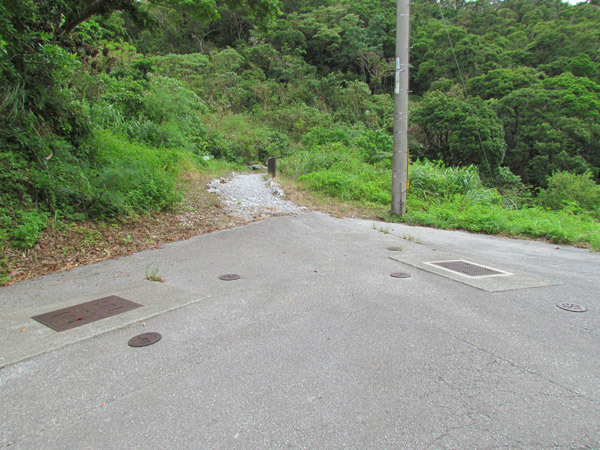 This is not the trail to Motobu Fuji. This goes in the opposite direction and its use is not quite clear at the moment. Taking Photographs. 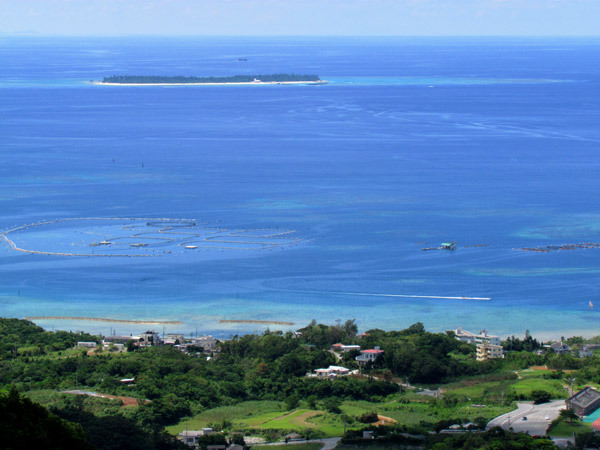 The best time to take photos of Ie Shima from Motobu Fuji is on a clear day before noon. The sun will still be behind you and you will not be affected by the glare. The Climb Up. The climb going up takes about hour and 30 minutes at a reasonable safe pace. This includes rest breaks, lunch breaks, water breaks, picture breaks, etc. You are gonna want to take pictures continuously. If you just want to go straight up without stopping it can take you about an hour. The Dangers. The greatest danger here is tripping and falling. 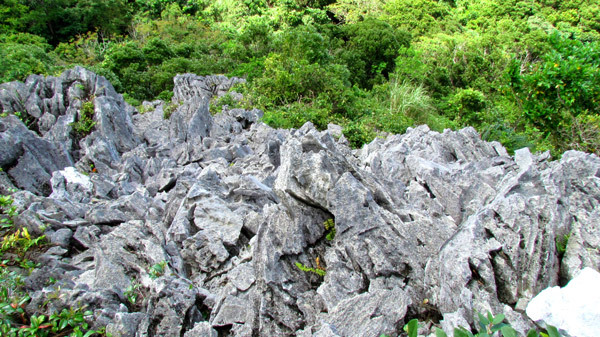 Karst stones are jagged and can easily cut through skin. A fall will lead to a very, very bad day. The greatest danger is on your descent trip. At this point, you are little more fatigued, in a rush to get home, and your momentum is going in the most dangerous direction – down! Take your time in both directions. Please read through all the recommended guidelines below. 1. Recommended climbing for young adults and above who have good agility and are physically fit. 2. Greatest dangers are tripping and falling. TAKE IT SLOW. Rocks here are not sturdy and some are very, very loose. Take nothing for granted. If you fall, you will get cut. 4. Keep low center of gravity (A MUST)...especially on your way down. 5. Highly recommend hiking gloves of some kind. 6. Highly recommend loose pants and long sleeves that allow for air circulation. This is to protect your skin from cuts from both the karst stones and snagging vines. 7. Snagging vines. Along the way you may run in to vines that have small thorns. These can cause you to trip and fall so you must take it very slow through some vegetated areas. 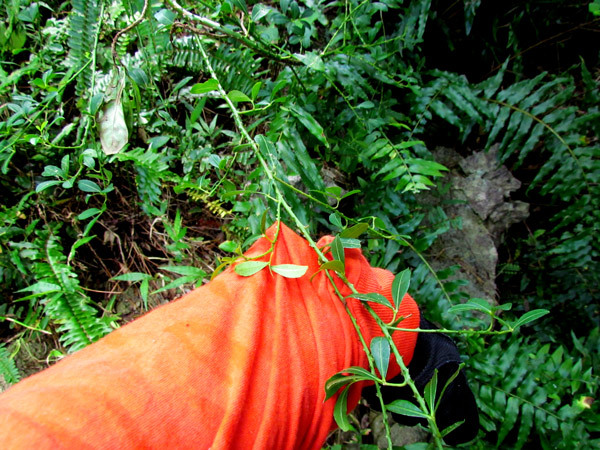 Though wearing long sleeves and pants increases your chances for getting snagged by one of these vines, it is manageable. 8. Bring plenty of water and nourishments (A MUST)...particularly on a hot day. 10. Mosquitoes. In the summer time, mosquitoes can be relentless on your way up. They can easily distract you and cause you to lose concentration as you are climbing. This can be dangerous. One wrong move and it will be more than just a minor mosquito bite that will sting. Recommend covering up as stated above and or use repellent to mitigate the distraction. You must really stay focused along the entire venture. Elevation: 218 Meters (715 feet)*. Directions. The GPS coordinates, N 26 40.461 E 127 54.738, is to the 'east entrance' parking lot. 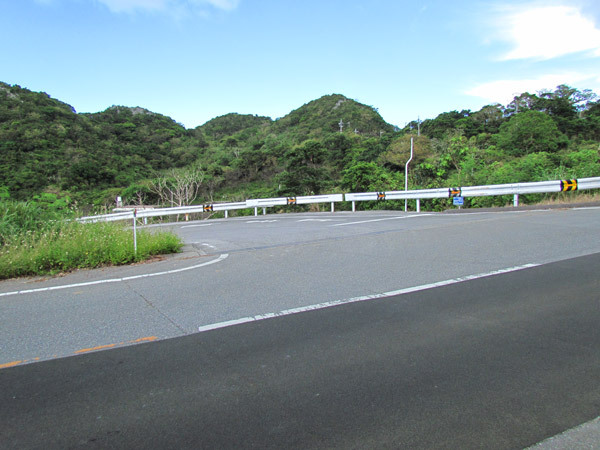 Take Highway 58 to Highway 449 heading towards Motobu. Continue along 449 passing the bridge that takes you to Sesoko Island. From that point, about 1.5 km you will run into a T-intersection (Highway 449/84). Left continues on Highway 449. Right takes you on Highway 84. Take Highway 84 going east. About 2 km more go left on Highway 115 (you may see signs pointing you to Nakijin Castle). 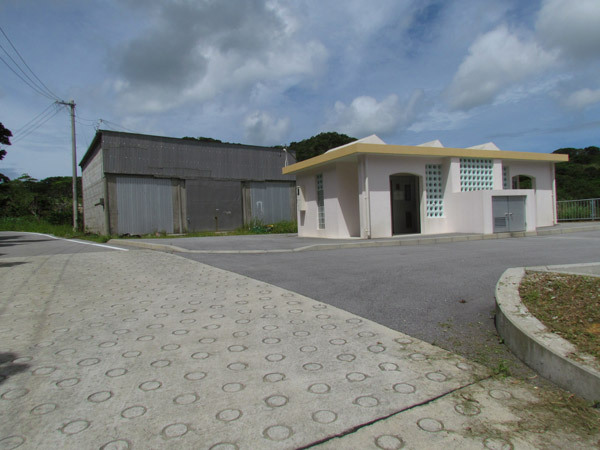 Shortly, along Highway 115 you will pass the Motobu Elementary School on your right. From here study the map carefully. At some point along Highway 115 you will be elevated (as if you are on a bridge). 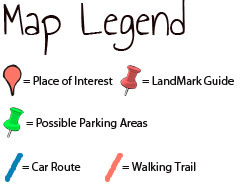 See Map Icon on the map. Once you cross over this elevated portion the road will bend to the left. Make the first left as soon as you crossover this elevated portion. This left hand turn will go down and to the left and then you have to make a right. This is the start of the blue designated route. Follow it to the 'east entrance' parking lot. 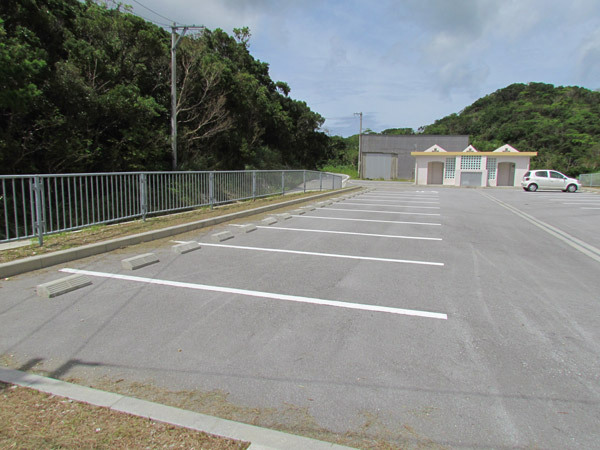 It is easy to miss the parking area since it is elevated off the road. Here is a picture of what it would look like from the road. From this picture, go left and you will soon see a restroom on the right. You are there. 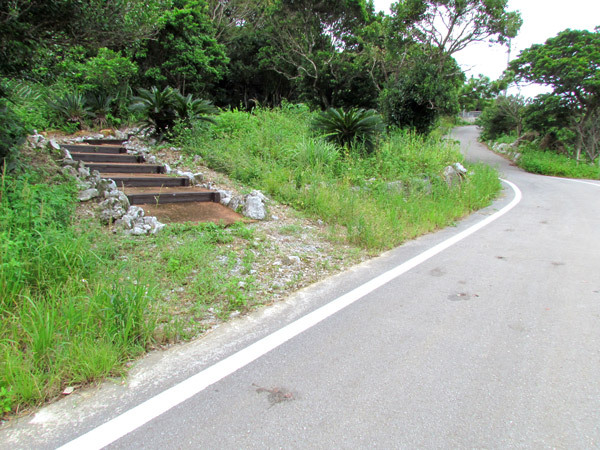 Other Hiking Trails on Okinawa. Awa-dake, Katsuu-dake, Furushi-dake, Yonaha-dake. Places of interest nearby. Toto la BeBe - Hamburger.